Knorr-Bremse, the global market leader for braking systems and a leading supplier of other rail and commercial vehicle systems, is living up to its overall product responsibility and helping to cut the carbon footprint of commercial vehicles. Internal comparative cradle-to-gate studies show that the two new disc brake generations from Knorr-Bremse, SYNACT (see photo) and NEXTT, present carbon footprints that are 10% and 11% lower than those of their respective predecessors. 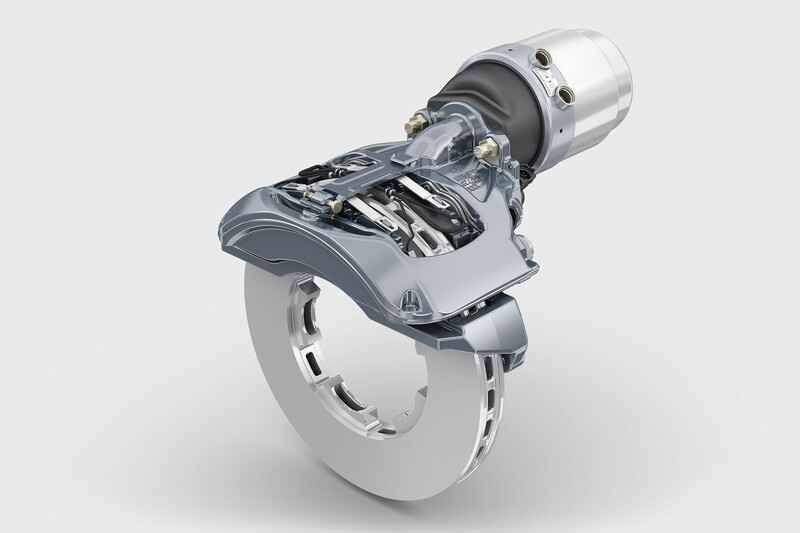 With the aid of life cycle assessments (LCAs), Knorr-Bremse compared its new disc brake generations – SYNACT® for heavy-duty commercial vehicles and NEXTT® for trailers and semitrailers – with their respective predecessors, SN7 and ST7. Both newly developed versions deliver marked advantages in terms of safety, reliability and customer benefits. The LCAs, which are based on ISO 14040, the international standard for life cycle assessments, document the progress made on the sustainability front. Assessment of the production process alone (from cradle to gate) reveals an 11% drop in CO2 emissions for the new SYNACT dual-piston brake compared to its predecessor. The same comparison for the single-piston NEXTT brake shows a 10% reduction. Then there are the savings achieved out on the road through the use of the optional Active Caliper Release-System (ACR). ACR is a mechanical system patented by Knorr-Bremse which, when the braking process is over, separates the pads from the brake disc and at the same time centers the caliper. This minimizes brake drag and the resulting power losses inherent to all floating caliper brakes. In-vehicle tests by technical inspectorate TÜV Süd confirmed that in a two-axle truck, ACR can deliver fuel savings of up to 1%. Extrapolated to a five-axle truck-trailer rig on long-distance service, covering an annual 100,000 kilometers, this equates to a reduction of 1 tonne of CO2 per year. The Ecodesign working group brings together representatives of the Corporate Responsibility function, the Rail and Truck divisions, and in particular from the Remanufacturing unit. In the aftermarket sector, Knorr-Bremse TruckServices adopts a Lifetime Efficiency approach and offers remanufactured products as a low-cost service option for older vehicles. And indeed the “second life” of a product brings a huge increase in its sustainability. Knorr-Bremse remanufactures used products in such a way that they can be reutilized in their original role with a shorter service life. Compared with a newly manufactured part, the overall life cycle assessment is very positive. Within the Commercial Vehicle Systems division, the portfolio of remanufactured products now covers some 500 different items which Knorr-Bremse markets under the EconX® brand. Despite the logistics of returning the used part, compared to production of a new product the CO2 emissions from remanufacturing are lower by as much as three quarters. In this way, in the first half of 2018, the company was able to save some 930 tonnes of CO2, 220 tonnes of material and 3,250 Mwh of energy through remanufacturing. These figures are based on LCAs that were audited and verified by the independent DEKRA institute. The emissions target that Knorr-Bremse originally set for itself for 2020 was already attained in 2014. The new target is for CO2 emissions from operations not to exceed their 2015 baseline level despite the marked increase in production capacities. With this in mind, the Group is working to boost energy efficiency at its locations and aims to achieve a clear increase in the proportion of renewable energy generated in-house, for example by its own solar power plants. At the end of 2017, the commercial vehicle plant in Pune, India, brought a 600 kW plant on stream. On sunny days, the solar plant generates enough electricity to meet all the plant’s needs, independent of the regional grid. Another positive factor is the further increased proportion of energy from renewables in the Group’s externally sourced electricity. By way of example, since 2017 the Hungarian production plants in Budapest and Kecskemét have been supplied with electricity sourced entirely from renewables.